Dodgy Rocks is an endless runner of sorts that uses RNG to procedurally generate the obstacles, boosts, pickups etc as you progress, while it get increasingly difficult the higher your score. @AshleySanders Hiya, gave it a spin. Samsung Galaxy S5. It works! I scored over 1000 points and then called it the day. Controls work fine. I found it frustrating that some rocks spawn very late at the bottom of the screen giving no time to avoid. A small glitch I spotted is that the boat seems to disappear beneath the waves on the left side of the screen? I can still see the wake, but the boat image is gone. Nice pixel art man. I also remember that game you and @flobar did for the SA Game Jam 2017 called 'Earth Prison'. That was very cool too! Did you ever manage to do more work on it? What are your plans for this little proto? @konman Thanks a lot for the feedback! I've noted to fix the late spawns of the rocks, and the player off screen issues you mentioned. Yeah we never ended doing anything with it after that, I'm not a huge fan of GameMaker so I've moved fully over to Unity. @flobar actually did the rocks, and some of the UI sprites for me in this game, that were intended for a different game. As for plans for this one, I'm thinking of adding 2 power ups that will aid in mixing it up a bit. And perhaps a leader-board. Looks pretty cool dude! Digging the pixel art! Regarding the leader board. Something you could add is, if I'm not in the top 5 players on the board, add my score at the bottom underneath so I can see how far I am from the top players. I'm using this in my game and I've found it helps to push users to keep playing. Cool man! I'll take a screenshot of my leader-board this weekend to better help illustrate for you. - To help push players to keep playing for the number 1 spot. 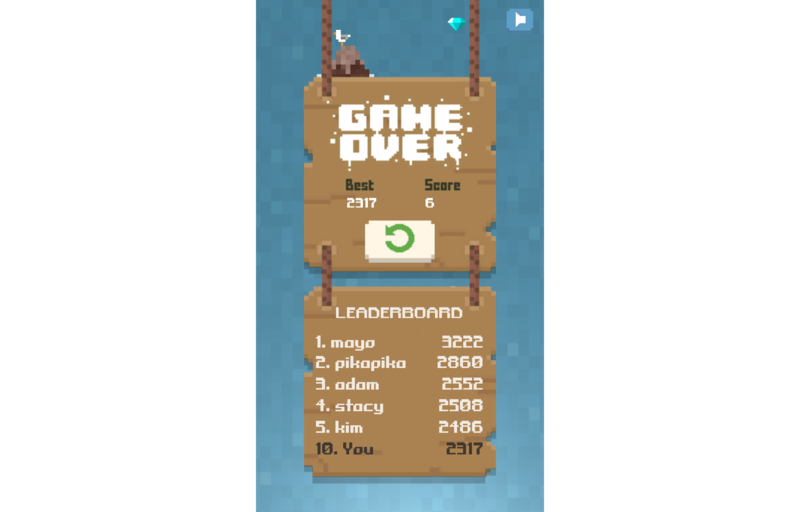 Why not add the leader-board screen below the game over screen? - So I can see my score and how far I have to go, every time after I die and not have to navigate to RESET and then LEADER-BOARD. - I tend to avoid the Turbo power-up cause I find it easier to move the boat without it. - Are they supposed to be obstacles? - This is just me, but I find the game takes a little too long to get into the meat of the game which is the most fun because its the hardest. - But it's just my opinion, others may disagree with me. - Another idea for an obstacle, is to have objects under the water that pop up with little warning! Like, an under water mine that's had it's chain cut. - So you have to be extra aware of your surroundings! This game has some cool potential! Keen to see where you go with it. If you need any assistance with getting AD's in the game give me a shout! @DavidKnightRedDawn Thanks for the continuous feedback man! (3) I feel you, I'm just not sure how I can over come this, perhaps by making it a little harder in the beginning? (3) So I would keep the start area but bring the difficulty closer to the beginning. So instead of getting the hard levels after 1000 points, make it 500 points. The start area is great for newbs but as you get good at the game, you want a way to get to the meat of it quickly. - You could also sell/win boosts to propel the player at the start of each round quickly to a certain point! - Actually boosts is a cool power you could add to the stage! Like if I pick that power up, the boat launches forward for a certain period of time. Any rocks I hit just get obliterated..
- With a cool down effect (God mode) afterwards to make sure the player can get into a safe space afterwards. I'm always a lil hesitant when considering pay to win but I guess the mobile world is more forgiving. Dig it man. The game also feels a lot better. Not sure what you did. The slowmo power-up is a bit hard to see but I guess you're not focussing on visuals just yet. Best way is to use the opposite color of the background to get it to pop! Like orange, yellow or red will pop from the blue sea background. But I'm digging the update! Gonna try get into the top 5 on the leader-board today! @Kim you better watch out!